Sometimes while browsing the web, we all stuck on a good looking website and asked a question “What theme is this?” If you are geek enough, you can easily open the source code of the website and check the style.css file to know the theme name and author name. But there are so many people who do know how to do this. For those people, there are few online tools available. These tools scan the source code of the website and return the name of the WordPress theme a website is using. What WordPress Theme is That? 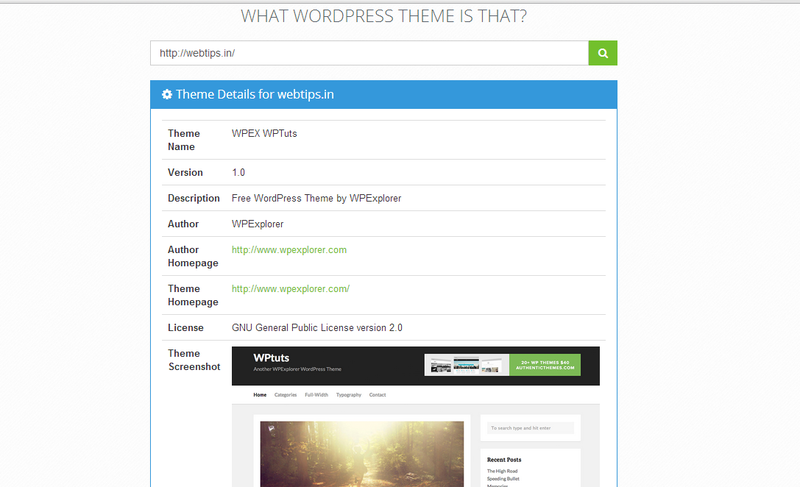 Is a cool website which helps you in identifying the WordPress theme a website is using. You just need to enter the domain of the website and click on search icons. It also lists all the plugins a WordPress website is using. This tool pulls the information from the stylesheet of the theme. You can check any WordPress website’s theme. This tool regularly gets updates to be compatible with all latest WordPress versions. A quick search for Webtips.in reveals that it uses WPEX WPTuts free theme. Yes, I liked this theme and started using this. 😉 But I customized few things. This tool depends on the stylesheet information. Theme and plugins come with name and author information in the stylesheets. This tool just scans those files to find the relevant information. But these tools are not 100% accurate. Website owners can edit those files to change the theme name or remove the theme name. So, it is possible to escape the detection by changing the theme name in the stylesheet. Various people do this. Still, you can find the theme information of various WordPress websites who are not changing those information. If you are looking for a good theme for your blog, you can check these WordPress theme stores. You can check and buy themes as per your requirements. If you do not want to pay, you can go with the available free themes. I also posted about various WordPress themes. You can check this section to find a good theme for your blog.